Kevin Stump spent 26 years in the U.S. Army. Sometimes, it takes a soldier to know a soldier. And Kevin Stump knows soldiers. He has to. His business depends on it. Stump is vice president/general manager of the training and logistics services division of PD Systems Inc., a service-disabled, veteran-owned business that trains soldiers. The company is largely staffed by veterans such as Stump. 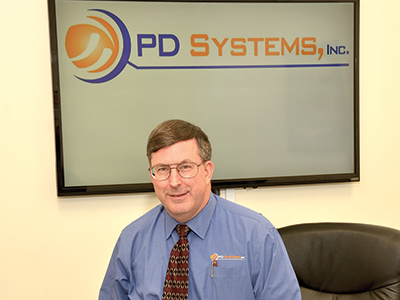 PD Systems has its headquarters and other offices in Springfield, but it also has locations in Prince George County and in Michigan. Stump is in Prince George. A Virginia Values Veterans-certified company, PD Systems has twice won the V3’s Governor’s Award for hiring veterans. “I think employers are working hard to hire veterans. The military is seen in a better light than in post-Vietnam days,” says Stump, 62, who spent 26 years in the Army and retired as a lieutenant colonel. PD Systems specializes in providing engineering, logistics and administrative services, as well as power systems and equipment. Stump says veterans represent 62 percent of the company’s workforce, and 27 percent of those veterans are service-disabled. Fort Lee, an Army base in Prince George County, is a primary client of the division Stump heads. Stump was a petroleum and water officer in the Army. Soldiers in that field handle bulk fuels as well as water treatment and distribution. Perhaps the most important contribution Stump made to his post-military career was making friends and keeping in contact with people he met along the way. When it came time to transition from active duty, Stump says he knew people he could call on for help. “You make a lot of connections and you build a reputation. When I came out, I had three job offers,” Stump says. He urges active-duty personnel to work hard every day, so they will have good references when they look for civilian jobs. No matter what the nature of their military training, Stump believes, veterans who embrace their military experience can move into civilian employment with a lot of intangible assets. “You have a capacity to learn, you have a work ethic and a passion to do well,” Stump says, emphasizing those traits are exactly what he is looking for in employees, as long as their skill sets match the job. Fort Lee is home of the Army’s Quartermaster School and the Quartermaster Corps, where logistics is king. “We are the trainers of the Army’s logisticians,” Stump says. His division hires and trains technical instructors for machinists, welders, mechanics, cooks, gunsmiths, warehousing personnel and a variety of occupational categories dealing with transportation. Because of the nature of the business (and the need to meet contract requirements), Stump is looking to fill his ranks with a heavy percentage of veterans. Most of his employees have had years of experience in the military, which give them credibility as instructors. Stump says that a minimum of 12 years of military experience is typical for someone becoming an instructor. PD Systems, through its subcontractor, Lean Insight, also has developed training for V3. In March, for example, the company won accolades for developing a curriculum to train a variety of institutions — including colleges and apprenticeship facilities — on best practices in matriculating, retaining and graduating veterans, as well as placing them with employers. Stump says V3 also hired the company to develop training for businesses on hiring veterans. Stump says that, in moving to civilian jobs, stability for their families is high on the list of veterans’ priorities. During a 22-year period, Stump and his family moved 17 times. For many military families, frequent moves and deployments — sometimes on very short notice — are part of the commitment they make. To find and attract qualified veterans, PD Systems uses networking, job sites such as Indeed.com and job fairs.